The Mission sport feels connected and confidence inspiring. The Mission sport feels connected and confidence inspiring.Designed around our new figure-hugging V-Flex™ belt it has maximum agility with minimum bulk. Slim articulated and flexible there’s a freedom of movement that’s essential for modern ‘3D’ super-sport routes. 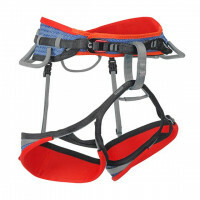 Lean, flexible and witha high-quality fully-featured finish this is a brilliant sportclimbing tool.